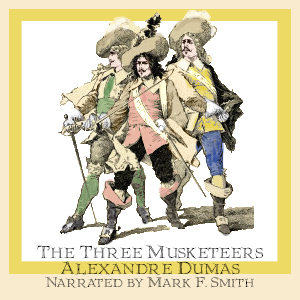 D’Artagnan, son of a poor Gascon aristocrat, travels to Paris to seek his fortune. His family connections enable him to obtain a position in a Guard regiment. His provincial ingenuousness and his hot-headed sense of honor earn him three duels in as many hours. Thankfully, his preparation with the sword is sufficient to recommend himself to his Musketeer antagonists, and they – Athos, Porthos, and Aramis – become his fast friends. But fate also crosses D’Artagnan’s path with some dangerous people who become his opponents: a mysterious “man from Meung” and a woman who styles herself Milady, who has formidable seduction skills and a heart that is mean and violent. Fate also inserts D’Artagnan and his Musketeer friends squarely in the middle of a love triangle of heroic proportions – between Anne of Austria (the Queen of France), George Villiers (the Duke of Buckingham, France’s enemy), and the great spymaster, his Eminence the Cardinal Richelieu. Both of these gentlemen can command the armed forces of their respective countries to battle simply for the pleasure of beating the other. And the Musketeers must serve and risk life and limb at the siege of La Rochelle, a place where the Duke and the Cardinal have chosen to match wills. In this age it was common for young cavaliers to live off the gifts of rich mistresses, and the four friends are certainly, it seems, bereft otherwise, although all are respectably employed as guardsmen to the King himself. Their love connections weave a further web about them which often seems to sidetrack their duty to King and country.